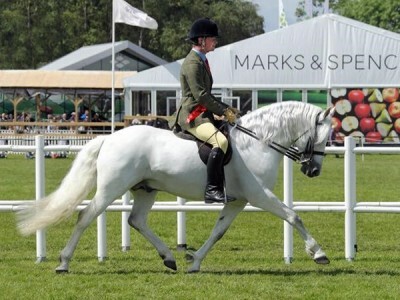 Fuinseoig Boy (Harvey) is a rising 9 year old Connemara stallion who was bought after Horse of the Year Show (HOYS) as a 4 year old from Kelly Jones. Harvey is the first and only stallion that I have ever ridden but as many people who have met him will know, he is one of the most relaxed and chilled out stallions ever. Very little phases him. As a 5 year old Harvey enjoyed his second season under saddle competing in Novice Picton and restricted classes with much success. As a 6 year old he qualified for Royal International (RIHS). We then enjoyed a very successful 5 days at NPS and Ponies UK championships winning the NPS novice working hunter final and championship, PUK Young Riders championship and an elusive ticket to the HOYS winning his Connemara and New Forest qualifier. In 2015 Harvey once again qualified for the RIHS where he finished 3rd in the open New Forest and Connemara pony class. 2016 has to have been our most successful season to date. 1st and Champion Young Riders at Midland Counties show qualifying for Hickstead, where we finished 2nd against very tough competition consisting of a mix of small and large breed ponies. We won the HOYS qualifier at the Royal Highland Show (with a ride mark of 47/50) and the HOYS qualifier at Scottish Horse Show where we were also stood section champion. Travelling to HOYS was exciting and were delighted to finish 10th against the best Connemara ponies in the country. Harvey also qualified for the Olympia-semi-final classes at the Heritage championships where he narrowly missed his Olympia qualification. Winning the Treasure Island trophy from NPS Scotland for the most points in M&M Showing classes in 2016 was the cherry on top of a wonderful season. Thank you also to Harbro for sponsoring the NPS Performance Scheme and for our rug and vouchers. Good luck for 2017 everyone! !